The PSAs were corny, but the quote has stuck with me throughout my life. Knowledge does answer questions and opens many doors to further inquiry. I am an avid reader, so whenever I take on a new project or endeavor in life, I like to read up on it so I know and understand it as well as I can. I continue to read about my pursuits so I am constantly growing my knowledge and understanding. In these On My Shelf posts, I will share books with you that I have found helpful in my pursuits as a freelancer. To start out, I have two books I highly recommend to anyone interested in game design, whether you are fan of gaming, want to design your own games, or want to help others with their game design. The Complete KOBOLD Guide to Game Design is a wonderful compilation of essays on rpg design by some of the best developers in the industry, covering core rules, magic systems, monster design, adventures and campaigns. 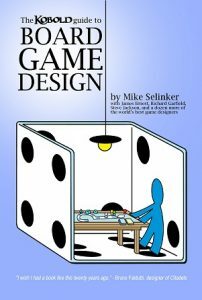 The Guide to Board Game Design contains more great essays focusing on board game conception, design, development, presentation, storyboarding, balancing, prototyping, and playtesting. 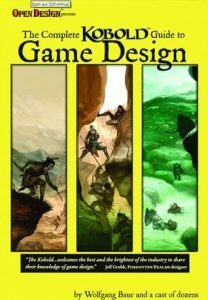 Reading those two books increased my understanding of the games I am passionate about playing, giving me insights into the design behind them. They helped me get a glimpse behind the scenes of the design, so as I am proofreading and editing, I have a clue why design decisions and language choices were made. If you want a better understanding of how games are designed, then I highly recommend these books and look forwarded to sharing about other books on my shelf in the future. ← Contacts – How Do You Build Relationships In The Game Industry? I devoured the latter of those books and enjoyed the insight into each accomplished designer’s mind. Games are like book and records – many flavours, some polished, others not, and something for pretty much anyone. This book helped reinforce that because it can really feel that every game has to be rated highly and loved by the majority of players to be a good game. And that simply doesn’t allow for as wide a spectrum as books and music enjoy. If you are all things to everyone, then you might be pretty bland. There is a lot of music that I don’t like, but that doesn’t mean those songs aren’t the absolute best connection with someone else. The game industry is pretty incredibly small compared to music and books and maybe that’s why a game is often either good or bad. There aren’t large enough niche groups within gaming yet. Last year over 2 million new book titles were published in the world. Only a few thousand tabletop game titles were published. Your insights on games in comparison to music and books is interesting. The concept that the game industry is still small in comparison and thus that impacts that “likability” of a game is insightful. I have found this true as my wife and daughters become more interested and involved in gaming. They have often found enjoyment in games that did not rate as well or gain as much general popularity. We often watch sale tables at stores and conventions for those games that often become some of our favorites. So many people love Last Night on Earth as “the” zombie game. While I loved the sense of being overrun in the last few minutes of the game, I found the rest of the game long-winded and complex. We probably won’t play it again . . . Same for Munchkins. We never quite felt like we were playing properly even though we kept referencing the instructions. For the 4 of us, two of us have Masters, one has 2 masters, and one has a PhD! It was kind of fun but the lack of confidence regarding playing it correctly will probably never have us trying again. BoardGameGeek ratings are good to a point, but a local game store with copies that can be played, and the time to explore is perhaps the best guide. Second to that is watching Rahdo Runs Through . . .
With games being so costly today, it’s painful to spend $50 on simply seeing if you like a game. Heck, we bought the 2 player Agricola: All Creatures Big and Small and thankfully we liked it. At $39.95, it’s an expensive gamble!